It was in the afternoon when Man Kerapu called me to go for short two to three hours netcasting right after break fast. It was around 8pm, when Man called and told that he would be at my place in five minutes. Took my bag which contained my netcast net, digital camera, torchlight & off I met him at the foot of my block. Reach spot at around 8.30pm and Man started to netcast and ended at 11pm. 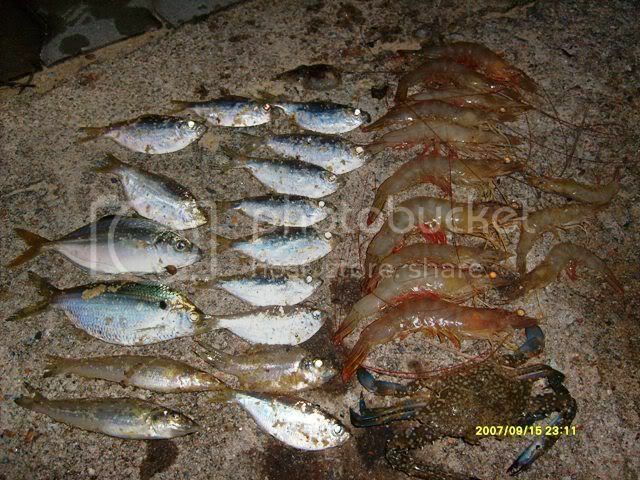 Catches includes Reg-legged prawn of various good sizes, various size of tua bak (tamban malam), selar papan, flower crab & pasir-pasir.